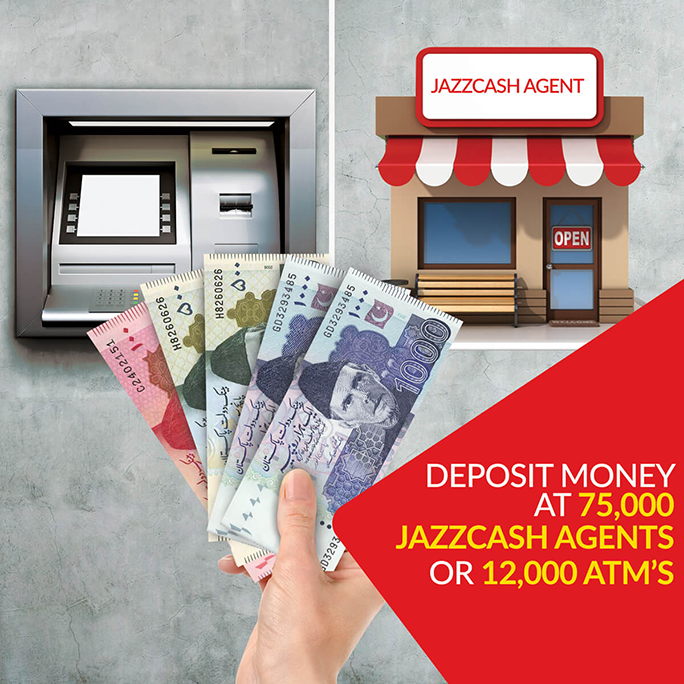 Deposit money into your Mobile Account instantly without any additional charges at over 75,000 JazzCash Agents spread across the country. Simply locate your nearby Agent by clicking here, provide your mobile number and cash to the Agent; money will be deposited into your Mobile Account instantly. If you have another Bank Account with an ATM Card, you can also visit your own Bank’s ATM and transfer funds from your Bank directly to your Mobile Account through Inter-Bank Funds Transfer (IBFT) facility. Please note that this option will only be available at your Bank’s own ATM, not on any other Bank’s ATM. Simply select funds transfer option, select Mobilink Microfinance Bank (formerly known as Waseela Microfinance Bank) as the receiver bank and enter your mobile number as the receiver account number to transfer money into your Mobile Account instantly. Please note that your Bank may apply a fee for this transaction, please contact your Bank’s helpline to find out more about this facility. Cash Deposit into your Mobile Account is FREE. For Money Transfer via ATM, make sure to use the same Bank’s ATM in which bank account is registered.